Dearly beloved, we are gathered here today to get through this thing called a marathon / half marathon (delete as appropriate). As all the great and good headed off to London, a few rouge SJs decided a day in the sun on the south coast would make an excellent substitute. 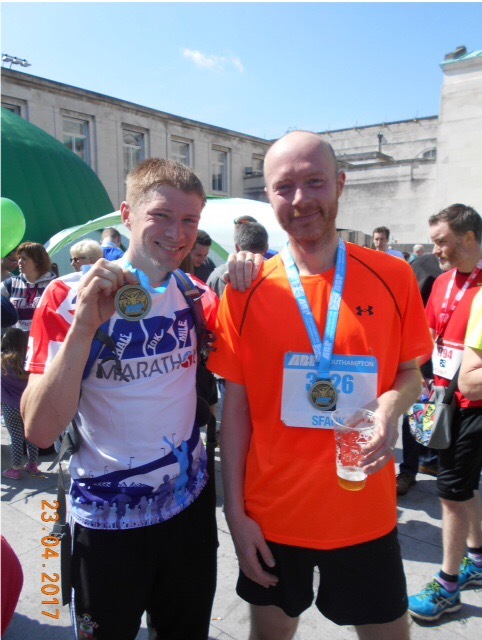 Rewind to last year and as my London rejection letter was still fresh in my mind, someone also told me there would be a marathon in Southampton on the same day with (drumroll please) free beer at the end! Without further encouragement I signed up for the half marathon secretly quite happy I didn’t now need to train for the full 26.2. The event was also quite exciting for me having previously lived in Southampton, so I was looking forward to going back after a 17 year absence. The event was really well organised, I particularly liked the community feel with a local street choir belting out modern classics before the race. Important runner essentials like short queues for baggage drop, shorter queues at the toilets, massages and good signage around the event village all made for a stress free arrival to the start line. Fellow Sandhurst Jogger Wayne Boardman had sprinted off an hour earlier in the marathon wave and James Ward and I were ready to fly off to represent the SJs in the half marathon wave. Having not run a half competitively for several years I was uncertain of how I would do, so I pushed my way back from the fast looking types at the front and listed as the Mayor of Southampton gave us all a quick rousing speech …..then the gun fired. My plan was to run 7:30mm but with many of these events the first mile is pretty busy as we winded around some residential streets in about 8mm, well for once in my life I might get this negative split thing right! I went by one of my old houses in the first mile which was a pleasant distraction and we passed Southampton FC’s old ground (The Dell) which is now flats / houses and the old cricket ground (Northlands Road) also houses / flats, then we also went past another house I used to live in! This run down memory lane was fantastic but I needed to get back to business and keep to my plan. As mile two unfolded the route was still quite busy and I ran a 7:45mm, still under pace, but I took this opportunity to remind myself of my excellent discipline to achieve the elusive negative split so many runners talk about (can we pretend that last bit about my discipline is true?) Mile 3 took us into the common and it’s here where the pack opened up and the beauty of the park and woodland motivated me around to mile 4 in 7:20mm, a little fast so I urged myself to slow down. As we pressed through mile 4, I spotted my wife and children waving and cheering furiously at me! This boost carried me to mile 5 in 6:50mm. My clock was telling me I was going too fast, I regained my composure and tried to slow down as we headed up to the main university campus and its here my watch battery died. OMG! We went through, miles 5, 6, 7 and 8 and without my watch I focused on the joys of running, still reminiscing on my old childhood / teenage haunts and high fiving the local kids who had turned out in their thousands to support us runners. Mile 9 was a huge treat for me as we went through Southampton FC’s St Mary’s stadium. I was starting to get a bit quiet out on the course but I wasn’t lonely for long as just before the dreaded Itchen Bridge the 10k runners were merging with the marathon and half marathon route. We struck out onto the bridge which comprised a 1 mile out and 1 mile back crossing of this local landmark. The views were stunning across the river and as I came off the bridge the 12 mile marker was upon me. A young boy in cub uniform was holding a sign which said “free beer at the finish” given the age old maxim ‘cubs don’t lie’, I decided to give it everything and ran as fast as I could over that last mile. As I weaved back to the docks, parks and into the city centre through the shops and past the bargate, I overtook a childhood hero of mine, the local, nay, international, legend(!) Matt Le Tissier (Editorial note, he once played for Southampton Football Club and scored many goals, Southamptoners love him and think he is god and anyone not from Southampton usually wonder what all the fuss is about ). Le Tiss, as his friends (and stalkers like me) call him, was running the 10k race for the children’s charity Ronald McDonald House and I shouted some garbled encouragement and awe related words at him. Before he could tell yet another deranged fan to just leave him alone, I saw the finish arch in the distance and tried to break into a sprint but my legs had turned to jelly; I was saved by the deafening noise from the crowd which carried me to that finish line. Tired and emotional I slowed to a shuffle as the pain of my accomplishment seized my legs, I looked desperately around for my free beer where was it?….. a medal, a tech tee, a few choccy bars and a banana was given…. Thank you, but where was this beer? Despondently I asked one of the finish line marshals if this free beer thing had all been a cruel joke… “NO“ he cried and I was quickly ushered away to the guildhall steps where a pint of amber nectar was thrust into my hand. Pure heaven…. Epilogue – Achievement means forever and that’s a mighty long time. But I’m here to tell you, there’s something else…..and they call it “Post Race Beer” and every runner should try it.